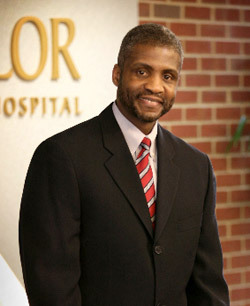 NORFOLK, VA – May 16, 2007 – City of Norfolk Mayor Paul Fraim recently announced the appointment of Michael L. Tucker, MD, to the Hospital Authority of Norfolk, the public oversight body for Lake Taylor Transitional Care Hospital. Dr. Tucker and fellow board members are appointed by the City Council to work in cooperation with hospital leadership and administration to set policies governing the hospital’s operations. Specializing in family practice for over 16 years, Dr. Tucker has a private practice in Norfolk. A graduate of Eastern Virginia Medical School of The Medical College Of Hampton Roads, Dr. Tucker completed his residency at Riverside Family Practice. Dr. Tucker is a current member of the Old Dominion Medical Society; Norfolk Medical Society; Omega Psi Phi Fraternity; and, Eastern Virginia Medical School Alumni Association. Formerly, Dr. Tucker served on the Board of Visitors of Eastern Virginia Medical School as well as the VCU Medical College of Virginia Alumni Association.